The Danish company Raidho has been bought out by another Danish company, Gamut, and the TD.12 is the first fruit of the relationship. [Technically (as commenter "chronoglide" has pointed out, Gamut is a brand of the company Dantax A/S, which now owns Raidho as well. - ed.] Re-engineered by Gamut head of design Benno Meldgaard, the new version of the Raidho speaker has a woofer with an underhung, 1.2 Tesla magnet system and a revised ribbon tweeter with, I was told, distortion 35dB lower in level. The sound on an Analogue Productions reissue of a Norah Jones album played on a Pear Audio Blue Kid Thomas turntable with Comet 2 tonearm ($7995) fitted with an Ortofon Cadenza Black cartridge ($1995) gave no clue that this was a temporary room. 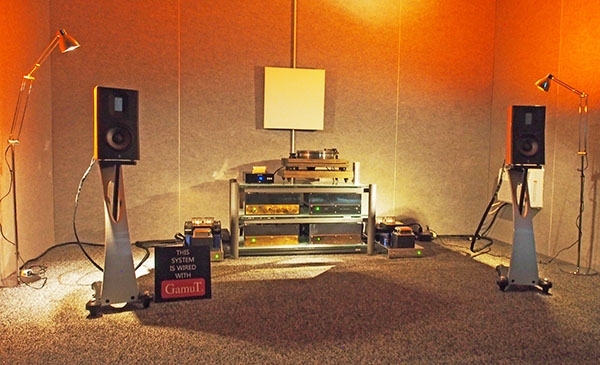 The system sounded rich and detailed, with superbly transparent high frequencies. However, I had to leave after two tracks because the tubed Jadis amps were heating the room up too much for this fragile New Yorker. "this fragile New Yorker" is one of the best closing summaries I've ever read. Stereophile's AXPONA reporting is a rather large bundle of the Finest Show Reporting in my 50+ years of memory. Phew!! I've worked Shows, I agree: no sleeping, meeting wonderful people, getting weather stuck at the AirPort, missing something important, taking pictures, meeting great new customers and suppliers. Phew, excited to go and more than glad it's over. ( usually overspending and probably overcommitting ). ps. thanks to Stereophile reviewers, I ( 4 Days ago ) bought a Audioquest Dragonfly RED for one of my Audiophile Grandsons and gave him one of my Sennheiser HD Headphones ! Just a point of correction: Dantax A/S owns BOTH Raidho and Gamut. What was stated above is not correct: Gamut did not buy Raidho at all, Gamut was bought by Dantax last year - so Gamut and Raidho fall under the bigger Dantax umbrella.